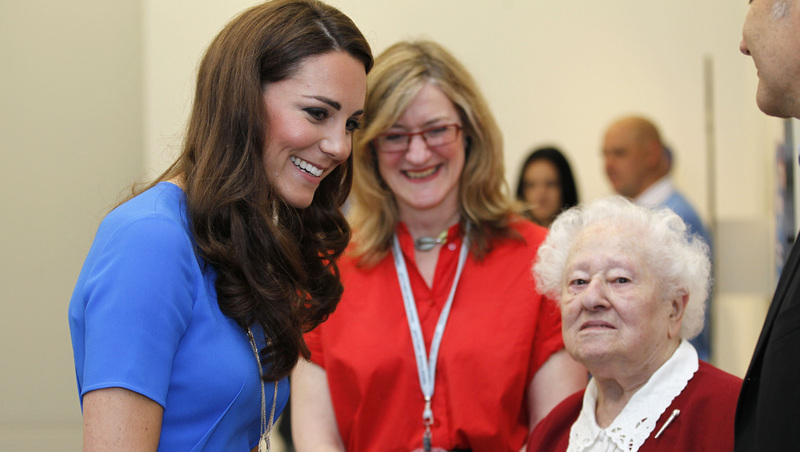 (CBS News) Kate, Duchess of Cambridge, met the oldest Olympic torch bearer for the 2012 London Olympics at the opening of a new exhibition on Thursday. Diana Gould is 100 years old and is scheduled to carry the flame in London through the borough of Barnet as a part of the 70-day relay. Gould, who was born in 1912, runs exercise classes three times a week in the retirement home where she lives, according to the BBC. Gould was chosen to sit for a portrait for the "Road to 2012" exhibition. The exhibition, on display at the National Portrait Gallery, features newly-commissioned photographic portraits of Olympic athletes. Kate, who has a formal role with the Olympics as an ambassador for Great Britian's athletes, visited the exhibition on Thursday. Her Portrait Gallery visit marks one of the many Olympic-related events she will take part in over the next several weeks.